Create a timeless road to your home with a beautiful custom paver driveway from F. A. Hobson Landscaping. Our paver driveways add a touch of elegance to your home and it is often the first thing that people will see when looking at your home. They also help with drainage and will last for many years. Individual pavers are easy to replace and the entire driveway is very low maintenance. 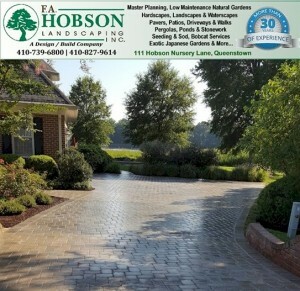 We can do different patterns and designs to customize it to your home, giving it more character than a standard driveway. Call us at 410-739-6800 and let us show you what we can do!